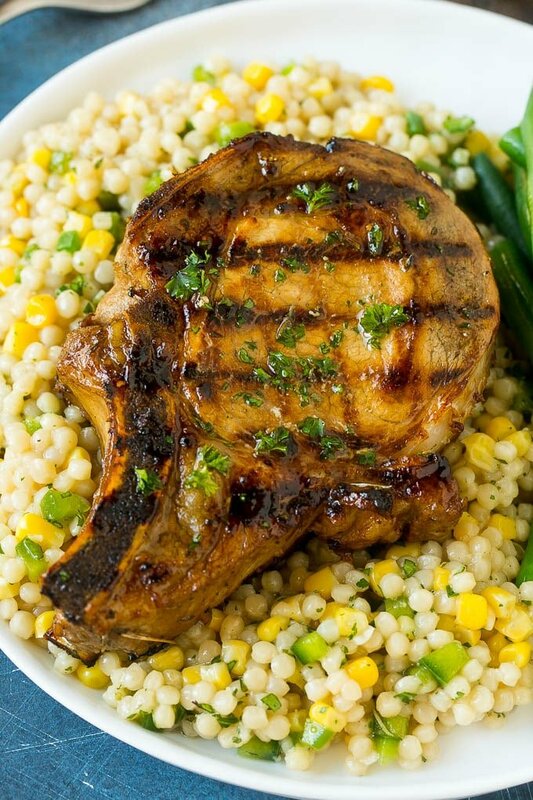 This pork chop marinade is a blend of garlic, herbs, olive oil, soy sauce, brown sugar and Dijon mustard. 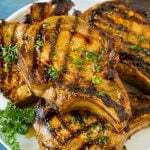 It produces perfect marinated pork chops every time, and you can use your pork marinade for baked, broiled, grilled or sauteed pork. Pork chops are a welcome addition to any dinner menu, and this marinated version is a family favorite. Serve your pork chops with mashed potatoes and roasted broccoli for a complete meal that everyone will love. 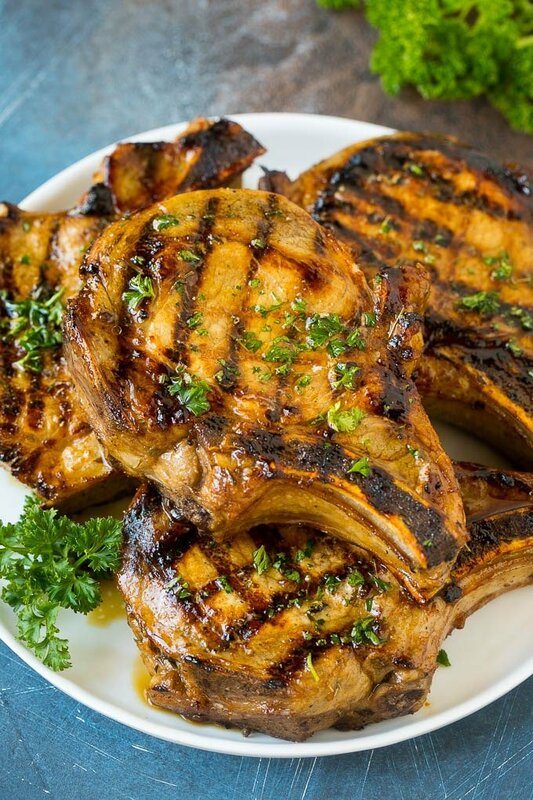 Pork chops naturally have a mild flavor which makes them the perfect meat to soak up a marinade. This pork chop marinade produces the best pork chops I’ve ever had – tender, juicy and full of flavor. You can bake, broil or grill your marinated pork chops for restaurant quality results that will earn you rave reviews. How do you make a pork chop marinade? This marinade is a combination of savory and sweet flavors and includes ingredients you probably already have in the house. The base of the marinade is olive oil, which is flavored with lemon juice, balsamic vinegar, soy sauce, brown sugar, Worcestershire sauce, minced garlic and Italian seasoning. How long do you marinate pork chops? Pork chops should be marinated for at least one hour. I recommend marinating your pork chops for a longer period of time for the best flavor, I try to let my pork marinate for at least 6-8 hours. This marinade can be made up to 3 days before you plan to use it. 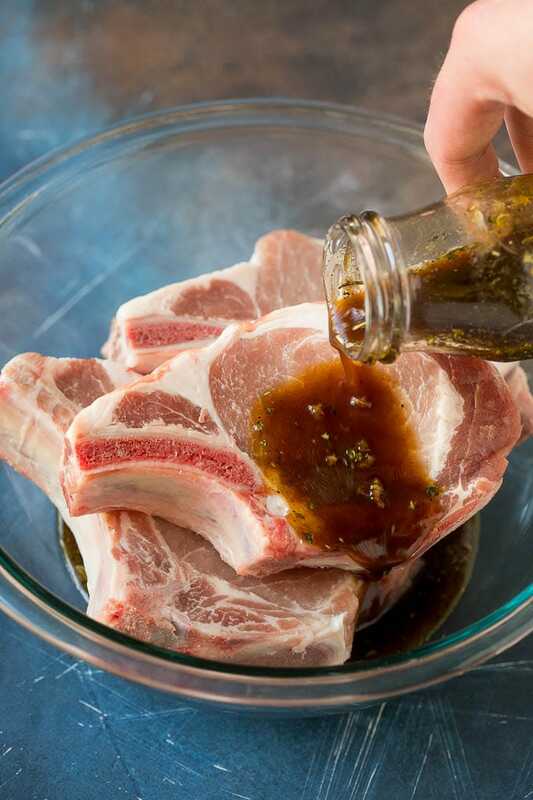 Simply store the marinade in the fridge until you’re ready to add your pork. You can really use any cut of pork for this marinade such as bone in pork chops, boneless pork chops, pork loin or pork tenderloin. This marinade contains sugar which adds great flavor, but can easily burn on the grill. Make sure your grill is not too hot before you add your meat! While this recipe is delicious as-is, you can add other ingredients to customize it to your tastes. Spicy: Add crushed red pepper flakes to taste. Herb Lover’s: Add 1/4 cup fresh chopped herbs such as thyme, green onions, rosemary or parsley. Scrape off the large pieces of herbs before you cook your pork. Asian: Use a blend of olive oil, toasted sesame oil, lime juice, soy sauce, brown sugar, ginger and garlic. Mexican: Use a blend of olive oil, lime juice, garlic, chili powder and onion powder. How do you cook pork chops? 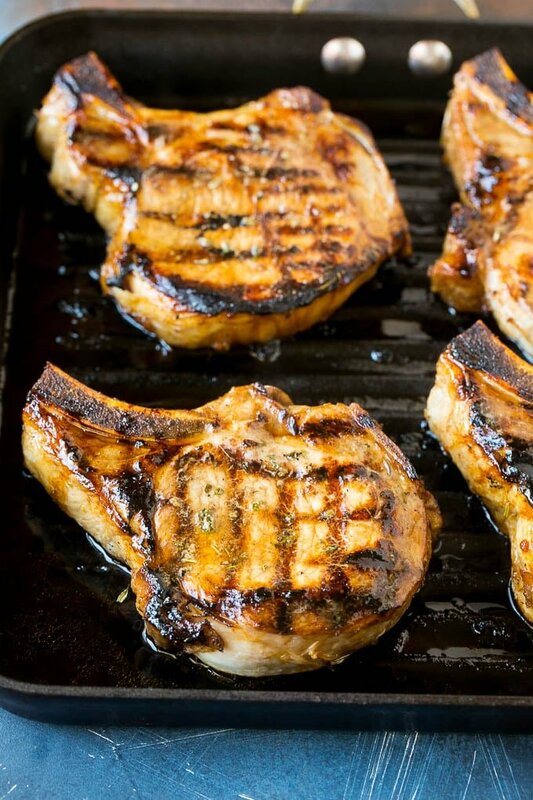 My favorite way to cook marinated pork chops is on the grill. If the weather isn’t nice enough for outdoor grilling, I use an indoor grill pan on the stove. If you prefer, you can bake or saute your pork chops. WHAT TEMPERATURE SHOULD PORK BE COOKED TO? Pork should be cooked to an internal temperature of 145 degrees F. The easiest way to gauge if your pork is done is to insert a thermometer into the thickest part of the pork – be sure that the thermometer is not touching the bone! Once you’ve reached the correct temperature, remove the pork from the heat and let it rest for 3 minutes before you slice it. 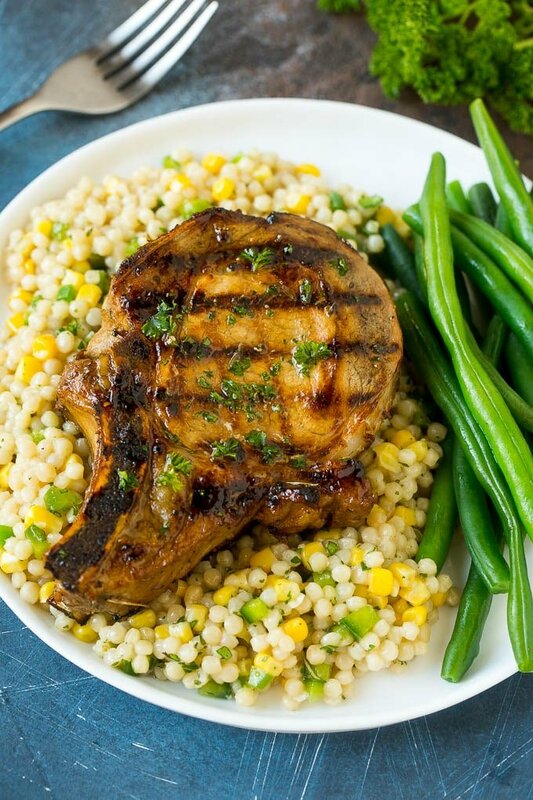 Once you try this pork chop marinade, you’ll find yourself using it on a regular basis! My family requests marinated pork chops all the time and I’m always happy to oblige. Place all the ingredients in a large bowl or resealable gallon sized bag. If using a bowl, whisk to combine the ingredients. If using a bag, seal the bag and shake to combine the ingredients. Add 2-3 pounds of pork chops, then marinate for at least 1 hour, or up to 12 hours. Proceed with cooking method of your choice. 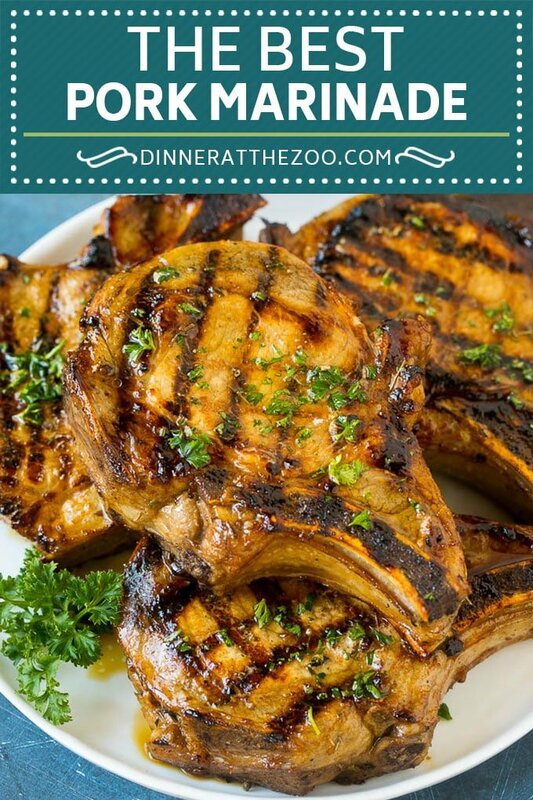 I love pork chops so I will love this recipe! Looks amazing! Looks incredibly delicious! Those flavors are amazing, Looking forward to trying this! If it’s one thing you know how to tackle, it’s a good pork chop. Sounds delicious as always! Can’t wait to use it!! And YES! Marinades are wonderful in imparting flavor and moisture to the meat. We like juicy pork chops! This marinade is right up my alley! Definitely using this for next time! I love a good homemade marinade! Definitely putting this on next week’s menu to try out!